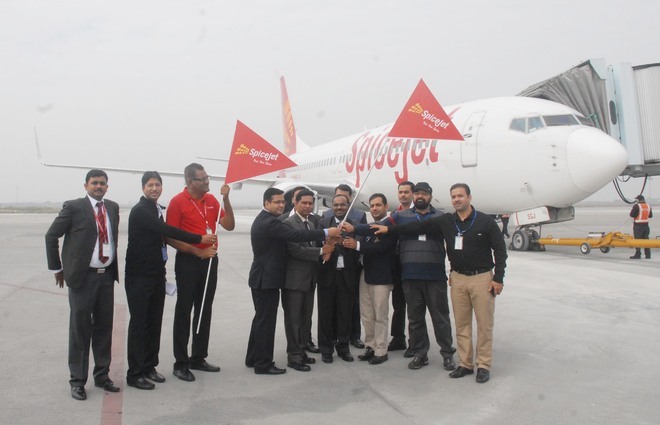 Amritsar, 14 November 2015:– The airline SpiceJet is set to launch its Amritsar-Dubai flight from tomorrow while Scoot Airline, a no-frills unit of Singapore Airlines, is expected to start operation of its Singapore-Amritsar-Singapore flight and Turkish Airline is also looking for starting a direct Instanbul-Amritsar-Instanbul flight by next year. After the exit of various airlines linking Amritsar with international destinations, Amritsar international Airport is once again looking for more international connectivity because many national and international airlines are evaluating options to open new circuits from here. The maiden Dubai-Amritsar flight of SpiceJet landed at Sri Guru Ramdas Jee International Airport with 174 passengers onboard on 15th Nov 2015. The budget airline has launched its six-day week direct flight between Dubai-Amritsar-Dubai. The long-standing of demand of passengers of NRI origin for direct air connectivity to the Middle East has been met. Already, Air India Express is operating an Amritsar-Delhi-Dubai flight. The flight takes about six to eight hours to complete the journey as the passengers need to wait at the Delhi airport for the connecting flight. GP Gupta, chief administrative officer, SpiceJet, said the new flight took less than three hours to reach the destination. He said precious time and money of passengers was saved. Shades of grey have began showing up amidst the fast depleting green cover over the historic Company Gardens that houses the legacy of Maharaja Ranjit Singh, the legendary ruler of Punjab, as a major chunk of the park has been covered by concrete in the name of its beautification.